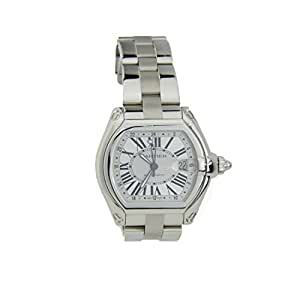 Cartier Roadster Large Automatic Stainless Steel Mens Watch. Self-winding automatic movementl.Push-down crown. Scratch-resistant sapphire crystal. Original Cartier silver sunray dial with Roman numerals. Date calendar window at 3 oâclock position. Functions: hours, minutes, seconds, and date. Original stainless steel Cartier bracelet.